Here comes Tiny Santa, here comes Tiny Santa. Riding down Tiny Santa Lane! I ordered up the Tiny Santa kit from Mochimochi Land and made these guys up over the weekend instead of doing important things. Like knitting the stuff for my friend’s baby shower. But that’s a post for another day (tomorrow, probably). 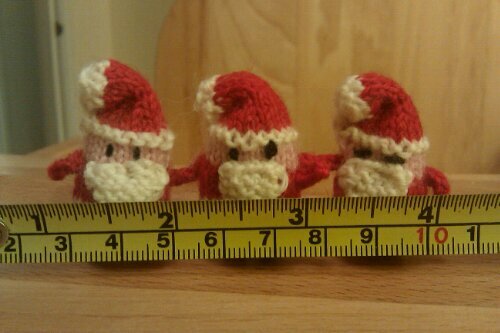 The Tiny Santa kit has enough yarn to knit up two Santas. But I’m either an exteremely tight knitter, really frugal with my yarn or made them wrong entirely (or some combination of the above), and I was able to get three. Next I plan to knit up some tiny snowmen and tiny reindeer to keep Tiny Santa company. AFTER, I finish the baby present!